When I was growing up my house was always spotless as my mum was a bit OCD when it came to keeping it clean. Looking back now I have absolutely no idea how she managed it, I don’t remember her cleaning that much yet I know from living with two young kids that it takes a lot of work to maintain a spotless house. She did spend a ridiculously long time hoovering though, she asked me to do it once but couldn’t believe I’d done it so quickly so she had to re-do it all! I can remember finding it so annoying that everything had to be in a set place and that we weren’t allowed to put our things down anywhere so by the time I was a teenager I completely rebelled and my bedroom looked like a bomb had gone off. I’m just not one of those people that has set places for things and feels stressed with there are toys everywhere which is a good thing because I have no time to tidy up and it’s pretty pointless anyway because it ends up looking a mess again in a few minutes. I do however like my house to be clean and I think there is a bit of a difference between those two things, I can handle clothes on my floor and toys everywhere but I couldn’t handle it if everything was filthy. The main things to help me avoid that are my dishwasher, this was something I didn’t think we needed but it has made such a difference to my life. Anti-bacterial wipes, you can get big ones for the floor and smaller ones for the toilet, I love them. Then of course it’s vacuums. I have a bit of a vacuum obsession have them in various places around my house which isn’t very big at all! I keep one upstairs which is easy to use quickly on the carpets then I have a steam cleaner downstairs as well as a cylinder vacuum, this is my favourite type for downstairs. I don’t get on with upright vacuums and find them too hard to manoeuvre plus they aren’t very good for doing sofas or corners. My old cylinder vacuum was on it’s last legs though so when Bissell got in touch I was very excited to put one of their C3 vacuums to the test, with the help of Cherry. – The size. It’s huge! The dust compartment on my old vacuum was really small and needed emptying every few days but I have been using this for weeks and it wasn’t even a quarter full when I emptied it. It’s really easy to empty and there are signs pointing to the filters, if you don’t already then it’s so important to empty and change filters. I didn’t know about this until a couple of years ago but it makes your vacuum like new again. – The handle. This makes it really easy to vacuum with. – The suction. The C3 is really powerful and stays that way even when the dust compartment is full up. I’ve tested it with glitter, yarn, sequins, gems and beads (all the things usually found on our floors!) and it hoovers them up without any issues. In fact here is a little glimpse into what can be found inside my vacuum, not something I ever thought I would be sharing with anyone! It would be a great choice for people wanting to hoover up pet hair. – The attachments. It comes with a whole range of attachments including an upholstery brush, a soft dusting brush for delicate areas and a hard dusting brush for curtains. They are all really easy to change, you just push that grey button near the bottom and switch them over. – Strong and Durable. 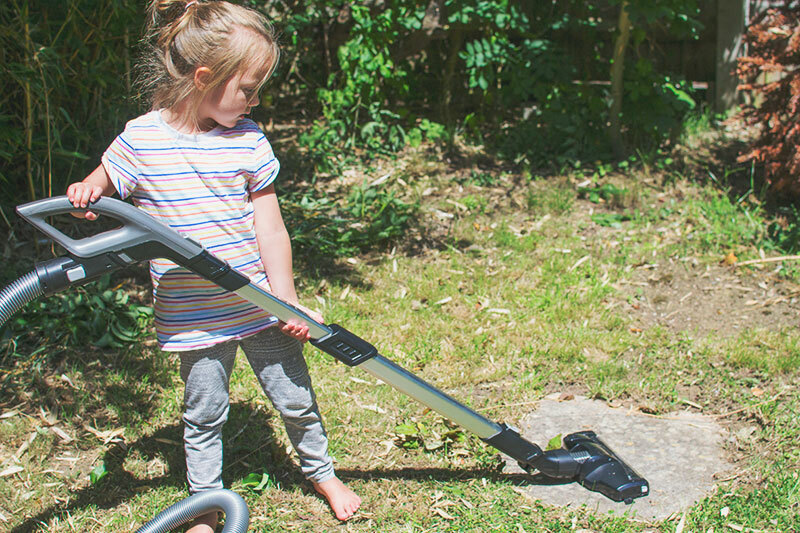 The hose is really strong and it’s all built really well, the plug pulls out really smoothly and goes back in easily and the large wheels make it really easy to pull around. Even Cherry gets involved! – It’s HEAVY! I find it really heavy and would struggle to get it up and down the stairs, I had to ask Mr C to lift it for me. It’s not an issue for us as it’s our downstairs vacuum but if you want something you can easily whip around the house then this might not be the best choice. – Hot Air. The Vacuum does get pretty hot when it’s in use, the air comes out the back and can heat the room up rather quickly which isn’t ideal on a hot day but on the flip side it would be amazing in winter. 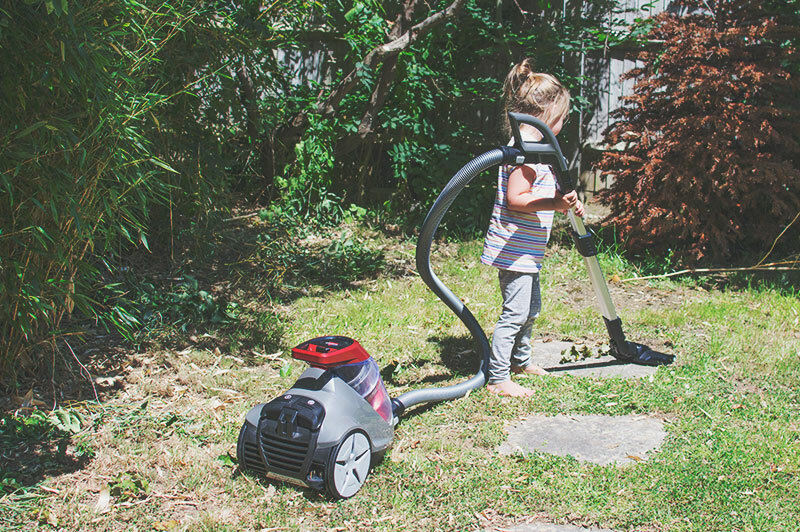 Given we only have about 5 hot days a year it doesn’t really matter anyway as it’s much nicer to get outdoors than stay in and hoover! Overall I’m really impressed with the Bissell C3, it has everything I look for in a vacuum. You can read all about it here. And if you want to see the full Bissell range including smaller vacuums, upright ones and steam cleaners then you can see them here. And finally if you are looking for carpet cleaners such as the Bissell Proheat then they have a very impressive collection. We were sent this product in return for an honest review.